Like many American cities, and maybe more than most, downtown Atlanta is riddled with surface parking lots that return little value in terms of revenue or curb appeal. 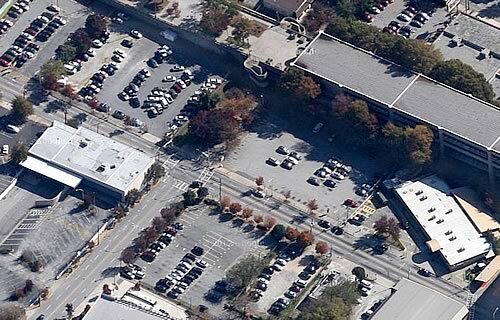 A satellite image is all it takes to see the damage: here’s a small sample of the surface parking surrounding the Garnett MARTA Station in Downtown Atlanta. Imagine what this could be instead and what kind of good this land could do for the city’s livability — and what it could do for the tax base — this area around a transit station was something other than this. The writer of the [Atlanta Bike Coalition] post is suggesting the tax mainly as a new source of city revenue, which is a good idea, but I think it could also spur redevelopment. The tax could encourage property owners to redevelop these blocks — or at least we’d end up with a new revenue stream that makes people think twice about the convenience of driving. Elsewhere on the Network today: The Minus Car Project gets excited about mileage-based car insurance rates, until he reads the fine print. Parksify implores cities to stop ticketing pedestrians. And Streets.mn explores the controversy around streetcar projects in the Twin Cities area. City leaders have proposed a tax break for new construction on downtown surface parking lots. Why Is St. Louis Using Tax Money to Subsidize Parking Lots and Bars?